This Corbin Russwin ED5800 is an exit only, concealed mount, vertical rod exit device. Trim, through-bolted lever, knob and pull trim are available separately. Supplied standard with a 36" long push-bar to fit doors that are between 30"-36". A through-bolted lever, knob or pull trim is available separately. 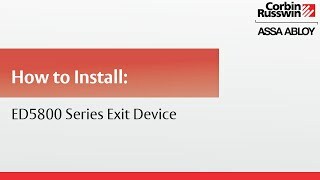 The Corbin Russwin ED5000 series exit devices are designed to suit multiple door applications that are of different heights, have different stile widths or require compliance with particular safety codes. The ED5800 will accommodate doors that are up to eight feet tall and it will fit on doors which have a stile measuring a minimum of 4-1/2” in width.